Ivan Lendl is a former World No. 1 professional tennis player. Originally from Czechoslovakia, Lendl became a United States citizen. He was one of the game's most dominant players in the 1980s and remained a top competitor into the early 1990s. He is considered to be one of the greatest tennis players of all time. Lendl captured eight Grand Slam singles titles. 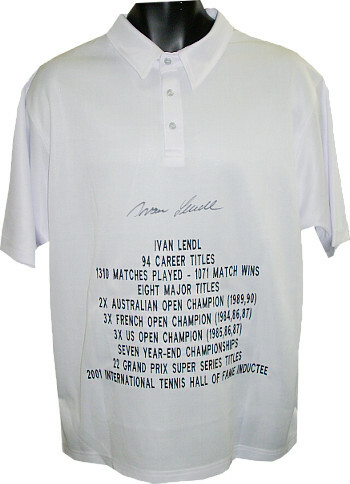 Ivan Lendl has hand signed White Polo Shirt w/ Embroidered Stats. JSA Hologram and Certificate of Authenticity.